The Jupiter-size planet HD 189733b orbits its star 10 times closer than Mercury circles the sun. The planet's close proximity not only cooks it, but also puts it within range of violent solar flares that further heat its outer atmosphere. The atmosphere of a Jupiter-size planet outside of our solar system is dissolving faster than anticipated thanks to its parent star, a new study finds. For the first time, scientists are able to measure an excited state of hydrogen on an exoplanet, revealing a temperature more than 10 times what they had expected. The findings could help astronomers understand how life might evolve on alien planets around one of the most abundant types of stars in the galaxy. "Our result is the first time in which we've been able to directly put a 'thermometer' to this hydrogen," said primary investigator Adam Jensen of Wesleyan University in Middletown, Conn.
Based on HD 189733b's distance from its star, which is cooler and smaller than the sun, astronomers calculated that the temperature of the outermost region of the planet's atmosphere should be around 2,240 degrees Fahrenheit (1,227 degrees Celsius). But by using the Hobby-Eberly Telescope at the University of Texas at Austin to take a direct measurement of the hot, or excited, hydrogen in the atmosphere, Jensen and his team pegged the temperature at a whopping 468,000 degrees Fahrenheit (260,000 degrees Celsius), more than 10 times hotter than expected. A portion of the topmost layer of air on virtually every planet escapes into space. This region is known as the exosphere, and while it is generally more energetic than the atmosphere beneath it, particles in the upper atmosphere are spread so thin that it still feels cold. "The main thing that's going to impact how much gas is leaving is the temperature of the gas relative to the gravity of the planet," Jensen explained. The scientists think that violent flares from its parent star are heating the exosphere of HD 189733b, causing the planet to bleed out its atmosphere more rapidly than it would around a more sedate star. Despite this advanced pace, however, the planet will only lose a small fraction of its mass over its lifetime. "The star will die first before the planet were to completely disappear," Jensen said. Three other planets were studied at the same time, but two lacked indications of excited hydrogen, while the third was inconclusive. Detailed findings of the study were published in the June 1 edition of the Astrophysical Journal. Hydrogen in this particular stage of excitation is prevalent throughout the universe, mixed into stars and clouds of gas. But this is the first time it has been studied on an alien planet. And this form of hydrogen could be present on Earth-like planets, as well. "Even though we're studying hot Jupiters, it's something that should be considered for other types of systems," Jensen said. This artist's rendition of a planet larger than Jupiter reveals its close proximity to its parent star, which puts it in range of violent solar flares that dramatically increase the temperature of its outer atmosphere. 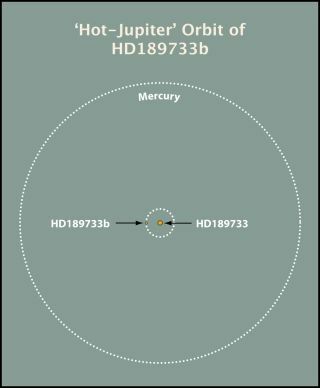 The orange dwarf star that HD 189733b circles is similar in many ways to red dwarfs, which are the most common stars in the galaxy. A recent survey revealed that up to 40 percent of red dwarf stars are most likely to have a super-Earth in their habitable zone, a narrow region around a star where conditions are such that liquid water could exist on a planet's surface. Tens of billions of such planets could exist in the Milky Way alone, suffering an assault from their parent star that resembles the beating that is being taken by HD 189733b. "We do want to consider the effects those stars could have not just on the atmosphere of a hot Jupiter, but of a more Earth-like planet," Jensen said. But being able to detect excited hydrogen in the atmosphere of an Earth or super-Earth with the necessary precision is still a few years in the future, the scientists said. Only a few dozen planetary atmospheres outside of the solar system have been studied over the last decade, and the majority of them are so-called hot Jupiters, gas giant planets that orbit close to their host stars. Still, Jensen is optimistic that atmospheric studies will flourish in the future, but this largely depends on future funding. None of the instruments currently in the works have the precision needed to detect excited hydrogen, but as technology improves, one may surface in the future. In the meantime, scientists can continue searching for hot hydrogen in the atmospheres of other Jupiter-size planets, which will improve their understanding of the process. Then, once a super-Earth is found with this level of activity, researchers will know what to make of it. "We're still very much in the process of trying to understand these atmospheres on other planets," Jensen said.